The first individual event of the meet. Some find it overwhelming to be first up on the big stage; others make the most of the opportunity. But like everything else at The Big Dance, there’s not a lot of room for error in the morning if you’re hoping to make it back for a second swim. In each of the last three years it’s taken a 4:38-mid to make the A final and between a 4:39.9 and 4:41.5 to make the B. Only in 2013 could you be just a bit off in the morning and still hope to get a second swim. The top seed times for the 2014 cohort are similar to those of last year, albeit a bit more bunched together. The four fastest all come in with 4:34-mids, then three 35s and a 36. The next eight are more spread out: 3.3 seconds separate ninth seed from sixteenth. If we assume it will take at least a 38-mid morning swim to make the A final, only the most consistently under 4:40 have a chance. The B final, on the other hand, could see a dark horse entrant with a 2-3 second drop in prelims. A quick glance at the sub-4:40s from the psych sheet shows how concentrated the 500 talent is among four conferences: SEC (7 of 17), ACC (3 of 17), Pac12 (3 of 17), and B1G (3 of 17). 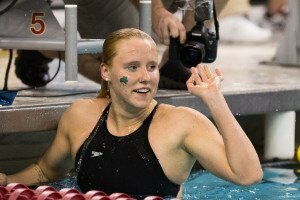 In the SECs alone, five women were 4:39.0 or faster in prelims (MacLean, Henry, Vreeland, Adams, McDermott); two in the ACC (Smith, Peacock); one in the B1G (Harding); and zero in the Pac12. Leah Smith, freshman, Virginia (4:34.35): Smith has had an outstanding freshman year, culminating in a first-place finish in the 500 at ACCs. She comes in with the top seed time of 2014, achieved at the ACCs. Her 4:34.35 was two full seconds faster than her pre-college times, and her best college effort by 1.8. Big drop. Even more impressive is how consistently she has gone 4:37s and 4:38s in prelims. 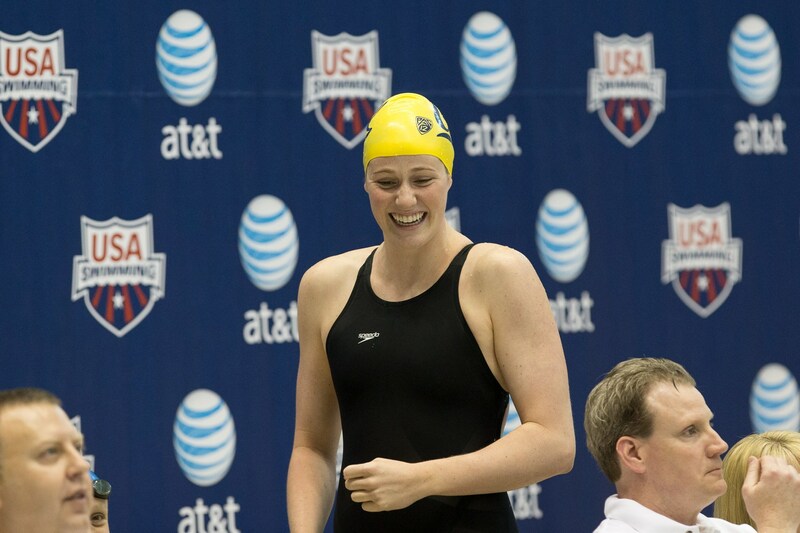 Missy Franklin, freshman, Cal (4:34.63): Franklin’s seed time comes from Winter Nationals, where she was only .01 off her lifetime best from Western Regional Sectionals in March 2013. Franklin won Pac12s with a meet record 4:35.73 after a 4:42 prelims swim, but she has only swum the event about a dozen times over the last two years, so we may not have seen her best effort yet. One has to believe that if this is where Teri McKeever needed her to score, they’ve been working on this for some time. Missy knows exactly what she needs to do in prelims and it seems pretty likely she will put up a big swim in the morning. Plus, she was a 4:38.3 in prelims at Winter Nationals so she’s done it before. Brittany MacLean, sophomore, Georgia (4:34.63): MacLean had a huge SECs, winning a very fast heat and setting the meet record with 4:34.63. It would seem she is really getting used to the 500y format (having specialized in the 400m in her native Canada). Last year she came into NCAAs with a 4:40 and dropped 1.6 to make the B final. This year already she is 4 seconds faster. Shannon Vreeland, senior, Georgia (4:34.73): Vreeland was second to MacLean at SECs, also finishing under the meet record. It was her best time since NCAAs of 2012. Vreeland has made top-eight at NCAAs in each of the last three years: she was 3rd as junior, 4th as sophomore, and 7th as freshman. Given that this is her final year, and that the defending champion Georgia Bulldogs seem to give each other a big lift in this event, we expect Vreeland to have a great 500. Amber McDermott, junior, Georgia (4:35.00): McDermott’s seed time comes from her third-place finish at SECs, where she was a 4:39.0 in prelims. McDermott came to NCAAs with a similar seed time last year and put up the morning’s top time. In 2012 and 2013 she went 4:36 in prelims; both times she finished second to USC’s Haley Anderson. Bonnie Brandon, sophomore, Arizona (4:35.43): Brandon’s seed time comes from her winning swim in finals at UT Invite in December 2013. Brandon has had an excellent sophomore year. She comes to NCAAs 4.5 seconds faster than last year, and already a half second faster than her fourth place finish in finals. Second to Franklin at Pac12s with 4:38.45, she’ll need to hit that time in prelims to make the A final. Camille Adams, senior Texas A&M (4:35.67): Adams’ seed time is from SECs, where she finished fourth (as she did last year). Her lifetime best is 4:35.66, which was her seed time at NCAAs last year. Adams was ninth in this event as a freshman, but added in prelims in each of the last two years and didn’t make finals. She went 4:38-mid in prelims at SECs, though, so this last year just might be her best. Stephanie Peacock, senior, North Carolina (4:36.40): Peacock was second at this year’s ACCs with 4:36.80, having gone 4:39-low in prelims. Her lifetime best is a 4:34.4 from 11/2012. She went 4:35.0 at NCAAs in 2012, finishing 3rd and was 15th in 2011. Sarah Henry, junior, Texas A&M (4:36.53): Last year she won SECs with 4:35.25; this year she was fifth with 4:36.53, which just goes to show how incredibly deep that conference is. Henry’s best time is 4:33.07 from November 2012. 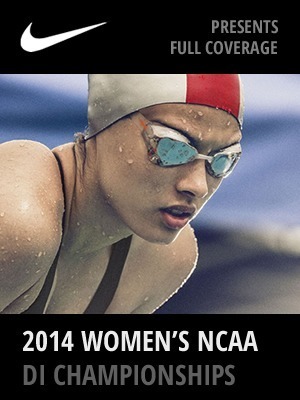 She came in to NCAAs as top seed last year, added 5 in prelims and qualified 9th. In 2011 she was 13th. Madison Jacobi, sophomore, Florida State (4:37.77): Jacobi had a huge drop at this year’s ACCs where she finished third. She is seeded more than 4 seconds faster than at last year’s NCAAs; she had achieved her previous best time of 4:41.85 at ACCs in 2013. Jacobi added 8 in prelims at 2013 NCAAs and didn’t make it back but she looks stronger and more consistent this year so she may rack up points for the Seminoles in this event. Samantha Harding, sophomore, Minnesota (4:38.05): Harding’s seed time comes from this year’s B1G, where she finished second to Vrooman but was the only swimmer under 4:39 in prelims. In 2013 her best was a 4:40 also from B1G, but she added 5 in prelims at NCAAs and didn’t get a second swim. At B1G this year she went exactly the same time in prelims and finals. If she can come up with another big morning swim she could do very well. Chelsea Chenault, freshman, USC (4:38.96): Chenault’s seed time comes from finals at the UT Invite in December 2013 where she went a 4:39.9 in prelims and 4:38.9 in finals, finishing second to Arizona’s Brandon. Her personal best is 4:36.69 from high school league championships in May 2012; otherwise she’s never been under 4:38. Chenault finished third at this year’s Pac12s with 4:39.30, having gone 4:40.3 in prelims. Danielle Valley, freshman, Florida (4:39.00): Valley had been going 4:40s pretty steadily for the last year, when she finally broke through with a great swim in finals at SECs and finished sixth. Her SEC morning swim was a solid 4:40-mid; another one like that might put her in the B final. Rachel Zilinskas, freshman Georgia (4:39.31): Zilinskas did a 4:40-low in 2012; it’s taken her two years to get back there, but she finally broke through at SECs where she qualified sixth out of prelims with a big five-second drop for a 4:40-mid. She dropped another second in finals and finished seventh. Kiera Janzen, junior, Minnesota (4:39.77): Janzen’s seed time comes from prelims at this year’s B1Gs; she ended up fourth with 4:42. 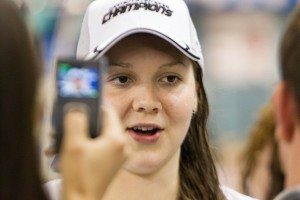 In 2013 Janzen had a huge, huge 4:35.70 final swim to finish second behind Lindsey Vrooman (who had set the meet record with 4:35.41 that year). The closest she’s been since was in prelims at 2013 NCAAs with 4:38.70. She went 4:41 in finals and finished 15th. Big prelims swims get you a ticket to the Big Dance; we’ll see whether she can do it again this year. Alexandra Norris, senior Ohio St (4:39.85): Norris was third at B1G this year with 4:39.88 in finals; her seed time is from prelims. Those two swims were her two best swims. Last year she went4:41 at B1Gs to make NCAAs, but was slightly off in prelims and didn’t get a second swim. Coming in faster and with more experience, Norris could put the Buckeyes on the scoreboard in the 500. 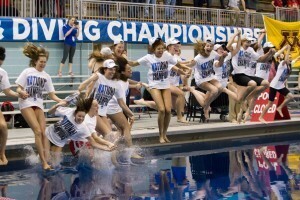 Over the past several years the 500 free has been a huge point winner for Georgia. In 2011 the Bulldogs placed 3 up/1 down and amassed 53 points; in 2012 3/0 gave them 46; and in 2013 3/2 brought in 56. We would expect another 3-up year for Georgia, and they have the depth to add another two to the B final with Zilinskas and Jordan Mattern. After a rather dismal 500 showing in 2013, Cal could pick up some points this year with a strong performance from Franklin; even more so if Catherine Breed or Melanie Klaren could hit a big prelim swim to make the B final. With two wins in a row from now-graduated Haley Anderson, USC has picked up nice points here in each of the last two years. Chenault could sneak into the A final but don’t expect this to be one of the Trojans’ stronger events this time around. The 500 has been a steady point-winner for Texas A&M over the last three years; with two of the top ten seeds the Aggies could improve their past results by as much as a factor of two. For the first time in the last several years Virginia is poised to score in the double-digits in this event. A big prelims drop from Hanne Borgersen would make it an even stronger event for the Cavaliers. Arizona, North Carolina, Minnesota and Indiana have all done well in this event over the past three years. With the exception of Minnesota who has two top-sixteen seeds, the fortunes of these schools rest primarily on the shoulders of one swimmer. Thank you for the great analysis, Anne! The 500/1650 are my favorite events, and I am greatly looking forward to them! And it is crazy that ledecky is still 6 seconds faster than the top seed and a full year out of college. It’ll be fun to see what missy can do in this! 4:30 is my bet. I love how even as the best backstroker in the world she doesn’t complain when she is placed in all of the freestyles. The bulldogs will battle for the next top spots. This could set the tone for Georgia/California… Cal needs Missy to win and make a statement… can’t wait! PS- To save the complainers time… please feel free to fill in the blanks below. How come you didn’t pick _________ to finish in the top 8? She’s clearly going to be… how could you be so blind? 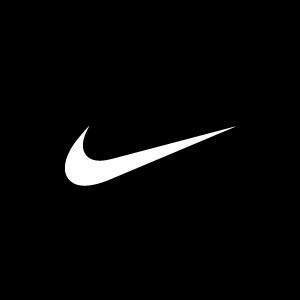 You are clearly based against schools from the _________ Conference… You guys are such homers!